Finding the best UVA apartment for your needs is vital as your apartment and community will be where you spend much of your time throughout the school year. At first, living on Grounds can be an excellent choice for many UVA students because of the convenience. However, over the years you may find the desire to move off-Grounds to enjoy a robust social lifestyle as you continue your studies at the University of Virginia. 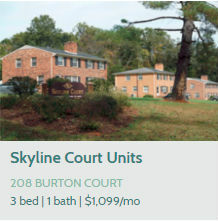 Whether you are looking to move off-Grounds for the first time or you want to have a larger apartment near UVA Grounds, then one of our three bedroom apartments could be the perfect fit for your needs. Depending on the three-bedroom UVA apartment that you choose, you will be able to find amenities and features that match your needs. As a college student, you have many variables to consider as you search for a great apartment near UVA Grounds. While renting a one or two bedroom apartment could be a great solution, you may want to consider renting a three bedroom apartment that is conveniently located near the UVA Grounds for a great lifestyle and student life. 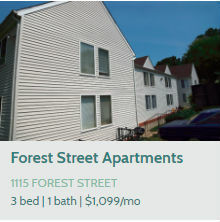 If you are currently looking for a three bedroom apartment close to UVA Grounds, then Woodard Properties can help you find the perfect fit for your needs. Our expert staff is here to help you find a great student three bedroom apartment in Charlottesville, VA.
We currently have several great three bedroom apartments that are desirable and affordable close to UVA and throughout Charlottesville, VA. Our three bedroom UVA apartments come with a variety of amenities and features depending on the apartment that you choose.